One of the places that has been on my bucket list long before I moved to the USA was a charming, mysterious city of New Orleans. For some reason I kept putting away a trip to probably one of the most cinematic cities in the world, waiting for some serendipitous moment to arise. This October, unexpectedly, I was invited for a journey to the city of my fantasy-novels-inspired dreams, exactly on the city’s 300th anniversary. After confirming my flight, I, in a dream-like haze, was saving all the information about haunted mansions, quaint bookstores, houses of famous writers and all the Instagram-worthy locations in Nola. But then I realized I have no idea where we should lodge! I undoubtedly dreamed to stay in a famous, and, by the way, ridiculously gorgeous French Quarter, but I wanted to steer clear of any loud hotels, filled with people who came to only party on a fun Bourbon street. Some AirBnb properties looked lovely, but when I saw some photos and read about Royal Sonesta New Orleans, I was intrigued. For me New Orleans is an enclave of a dark and beautiful history, rich with layers of French and Spanish Creole culture and architecture; a magical place where time doesn’t exist and you loose yourself in a time travel fantasy, while listening to the best jazz music you ever heard. 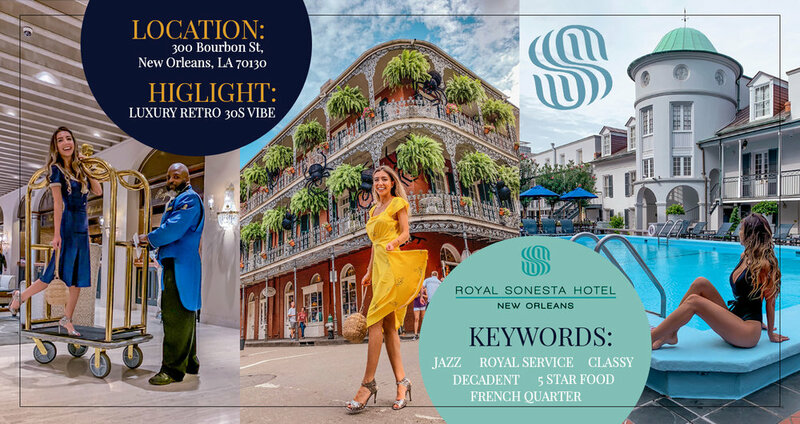 The hotel Royal Sonesta was a perfect choice for such a nostalgic soul like me, and it let me immerse myself into that classy, elegant, yet seductive and mysterious New Orleans dream I imagined for many years. The grand lobby of the Royal Sonesta hotel looks like a movie set: a big old style wooden hotel reception with keys and neat envelops, hotel porters in sleek royal blue uniforms, vintage and antique items beautifully placed here and there, exquisite chandeliers and candelabras, water fountains, huge flower bouquets lushly blooming and filling the room with their sweet aroma and a soft jazz music playing on the background teasing the guests with the promise of one-of-the-kind stay. The moment we stepped into the Royal Sonesta, I knew this is my kind of place as it reminded me of small chateaux in France, “The Grand Budapest Hotel” film and some lavish vampire pre-ball (of course! We are in NOLA after all!) setting at the same time. There are almost 500 newly renovated beautifully decorated guest rooms and luxury suites, and the room we had was so cozy and charming that we loved going back to it and taking breaks between venturing out for long walks with a stop for delicious beignets and coffee at the world famous Cafe du Monde, and getting back out to the most wildly intoxicating and mysterious night air of New Orleans. 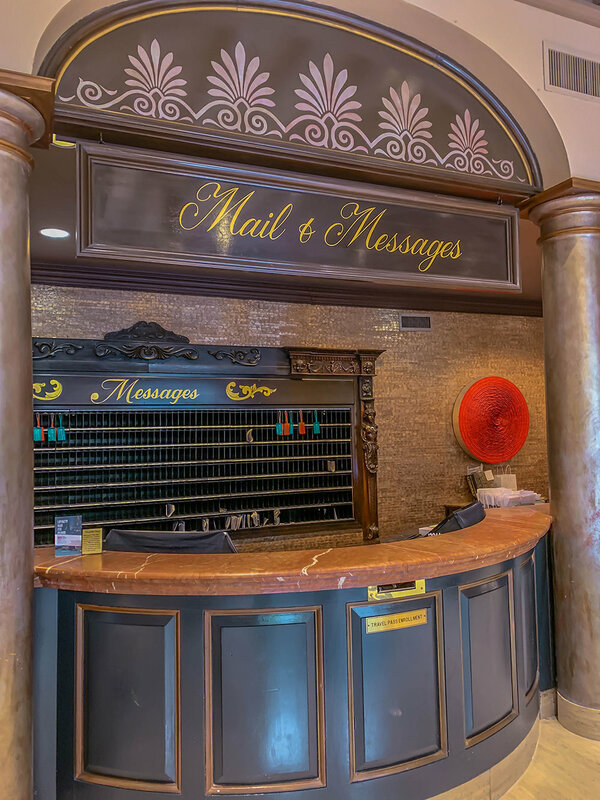 Conveniently, the hotel Royal Sonesta is located right in the heart of the French Quarter! The service at the hotel, by the way, was absolutely impeccable and I was able to learn about famous Southern hospitality firsthand. Once, for example, I asked for a steamer, and it was delivered pretty quickly, so I was able to steam my dresses for the city strolls. The breakfast and even lunch were included with the Sonesta Travel Pass (it is a loyalty program I recommend you to join as it has a lot of great perks! Learn more here), and even though I am usually pretty picky with hotel breakfasts, I was really happy with the variety and also some of the unique breakfast options Royal Sonesta offered their guests. I got to try grits for the first time in my life, and loved substituting my usual oatmeal with it. Another really sweet, in every sense, detail is that there was a full candy bar with Halloween chocolates, caramels, cookies and gummy worms, along with fruits and tea/coffee available from early morning to late night at the breakfast lounge. I might or might not sneaked some chocolates every night before going to bed to watch “Poldark” (not the most New Orleans inspired show, but I love period dramas, and I finished watching the most New Orleans’ show ever, “The Originals”, months ago!). The hotel by the way, despite being located in the heart of the French Quarter, felt like a luxury quiet oasis from a bygone era. The sounds of a bursting with life, Bourbon street, somehow do not travel through the walls of Royal Sonesta. The lush courtyard with a fountain and quaint little tables are welcoming to have a calm little moment with a book or your own thoughts. The pool area of Royal Sonesta is also absolutely beautiful and a great place to relax and enjoy the sunny weather of Louisiana’s most exciting city! There are so many great little things and charming little details about Royal Sonesta, but I think it is important to note that the hotel is also home to some of the best dining and entertainment venues, making it even more unique! The Jazz Playhouse is arguably the best jazz club in the city, offering incredible live jazz music every evening right in the lobby level of Royal Sonesta. Desire Oyster Bar is another dining venue inside the hotel and it was so good that we went there twice for fresh chargrilled oysters, amazing creole food, like jambalaya and gumbo, and a wide variety of fresh seafood. There is also a Restaurant and a bar R’evolution, Le Booze and PJ’s Coffee Café inside the Royal Sonesta Hotel, which we haven’t had a chance to experience. I heard from other guests that R’evolution serves some of the most interesting Cajun and Creole dishes and original cocktails, so I am looking forward to visit it next time in New Orleans (and I hope to be back for many many times in the years to come!). This New Orleans trip was special for many reasons, and the Crescent City absolutely stole my heart like no city has ever done before (except maybe London back in 1999 when I visited it for the first time and made a wish to move there one day, which happened years after, but that is another story). I believe that accommodation is so incredibly important and should reflect the mood and aesthetic of your dream trip, and Royal Sonesta with its impeccable service, gorgeous classy 1930s-style-luxury-hotel decor and many charming spots, like a jazz filled ballroom, a courtyard with a pleasant babbling fountain and a decadent dining areas deserves all the stars I can give to it! 1. Marie was an Austrian princess. It is a common mistake when people think that Marie Antoinette was French. She was born Maria Antonia Josepha Johanna and was the 15th child of Holy Roman Emperor Francis I and Maria Theresa, Queen of Hungary and Bohemia – the rulers of Austria. At home they called her Antonia, but after she moved to France, she changed her name to something more française, to Marie Antoinette. 2. She had a sharp mind and many talents. Future queen of France was growing up showing a great potential. Marie played the harpsichord, spinet, clavichord, and harp. She could speak German, French and Italian. She was also a very beautiful, graceful dancer and a talented singer. The only thing she was scolded all the time for was her poor handwriting. 3. Marie Antoinette was an ugly duckling. Marie Antoinette was betrothed to Louis XVI of France when she was just 12. During the negotiations, the French court had made unpleasant comments about Austrian princess' appearance, noting that her teeth are crooked. Apparently it was a serious obstacle, therefore French doctor Pierre Laveran was immediately commissioned to perform very complicated and painful oral surgeries to perfect Marie's smile. These surgeries were performed on 12 years old Marie without anaesthesia and took several months in total before she could smile back at her haters, showing new straight and beautiful teeth. 4. Marie became a beauty in her teen years. The surgeries and puberty transformed Marie into one beautiful, elegant creature. When she arrived to France at the age of 14 people loved her for her beauty and admired her bright blue eyes, porcelain white skin and ash-blonde hair. 5. It took seven years for the future king and queen to consummate their marriage. Marie Antoinette and Louis-Auguste were married for 7 years before they finally became intimate with each other. It is believed that the dauphin was suffering from a painful medical condition that made him impotent. The gossip about the "fake" marriage was circulating all around Europe. After many years, the rather piquant and peculiar problem was resolved either by a surgery, or by other mysterious interference in the Royal chambers. Within a year, Marie bore the first princess of the couple's 4 children. 6. Marie Antoinette had a diva hairdresser. Famous Parisian hairdresser Leonard was so in demand that he could not leave his salon in Paris often enough even for the Queen herself. He had appointments with her only on Sundays at a very strict time. Leonard is responsible for creating Marie Antoinette's the most iconic hairstyle - the pouf. The pouf was almost like a mood-board, expressing political messages, favouriting people and fashion trends, through intricate shapes and extravagant accessories. For example, Marie Antoinette wore a big sailing ship hairstyle to celebrate the alliance between France and the American colonists. 7. There is a U.S. city named in honour of Marie Antoinette. The first permanent settlement of the Northwest Territory in 1788 was named in honour of France and the French queen, Marietta. Marietta was an affectionate nickname for the Queen. The city hasn't changed the name since and is located in the state of Ohio. 8. Marie was a coquette, beauty guru, life of a party and a trendsetter. Bathing was one of the greatest luxuries of that time, and while most people bathed once a year. Marie had a daily baths with aromatic oils in her private bathroom. Marie would sleep wearing gloves coated with a mixture of wax, rose water and sweet almond oil to keep her hands soft and young. Marie Antoinette also had an envious wardrobe as she ordered about 300 gowns a year. She also purchased shoes, jewellery, accessories, hats, make up products, expensive perfumes, essential oils and other "beautiful thing" almost every single day! She was also a heavy gambler and spent close to $7 million dollars by today's standards on her "pleasure house". Her unpopularity with the French crowd was growing as fast as her bills. 9. Marie showed a great bravery and wisdom at the end of her reign. Before the French Revolution threats, Marie was not heavily involved in political decisions, and as she often wrote, had a very little influence over her husband's decisions. However, when revolution was about to break out in France, the Queen started actively seeking ways to save her family and the monarchy why the King remained indecisive and apathetic. She was meeting with ministers and ambassadors, was writing to other Royals seeking for military support. Many was offering help to the Queen, however she was refusing to escape France without her entire family. Unfortunately, their only attempt to escape was a late made decision, and they were all captured within 24 hours. 10. She remained herself until her very last breath. Unfortunately, Marie Antoinette was beheaded on October 16, 1793. Her last words are reported to have been, “Pardon me, sir, I did not mean to do it”, when she accidentally stepped on the executioner’s foot while climbing the scaffold. Check tomorrow for more curated Marie Antoinette theme inspired items! For centuries, the history and the myth of Cleopatra has been a great inspiration for artists all around the world. Cleopatra's praised beauty, seductive powers, love affairs with two most powerful men of her time and her tragic, but poetic death has been the theme in the works of generations of creative minds, including Shakespeare, Michelangelo and Salvador Dali. It is important to note, that aesthetics and the canons of beauty undoubtedly change over time and place. Therefore, Reneissance's Cleopatra and Cleopatra depicted in the Gilded Age Era will be absolutely different, but at the same time the most striking for the audience of the time when the new image was created. On following paintings, Cleopatra is depicted as a glorious, sometimes ruthless Queen in her prime years. She enjoys the romances with Caesar and Anthony, throwing fabulous feasts and lives a lavish life of the self-proclaimed Goddess. It is interesting that many artists disregard being historically accurate, and depict Cleopatra according to not only beauty standarts of their time, but also fashion styles. For example, on the works of Gerome, Cabanel and others, Cleopatra looks like an exotic oriental nymph. Lawrence Alma-Tadema, on the other hand, waived the oriental look in favour of more historically correct Hellenistic outfit. It is interesting that many artists of Reneissance and 17th century were more likely to paint Cleopatra as a white skinned beauty with golden locks. But after 19th century, artists started to give a preference to more exotic looking, darker Cleopatra. The death of Cleopatra has inspired more paintings than even her love life and glorious days of the reign. It is believed that Cleopatra has used an asp to kill herself as she did not want to be presented as an Augustus' trophy and be a part of his triumph. It is documented that the Egyptian Queen has been bitten by a venomous snake in the hand, however Shakespeare in his Anthony and Cleopatra play, wrote that beautiful Cleopatra pressed a snake to her body and let it bite her breast. The sexualised version of Shakespeare has been enthusiastically taken by other creative artists, writers and filmmakers ever since. Two almost identical paintings of Cleopatra by Benedetto Gennari. One blonde and one brunette Egyptian Queen. The Death of Cleopatra by Gyula Benczúr. Probably one of the few paintings that depict Cleopatra as an old, suffering woman. Majority of artists prefer to disregard the fact that Cleopatra was 40 at the time when she committed suicide. During Art Deco, artists exploited the story of Cleopatra and transformed her from an important historical figure to the coquette, lovely seductress and femme fatale of the Gilded Age, Only little symbols and exotic clothing help to identify this new Cleopatra. Hope you enjoyed the selection of my favourite paintings and sculptures depicting the legendary Egyptian Queen. In the next post you will be able to see celebrities and models of our time channeling their inner Cleopatras on the red carpet and runways. Prepare for the golden fashion galore, and don't forget to check our daily updated Cleopatra Themed Shop. The Third Week on Pastiche.today is dedicated to the most famous, seductive and powerful woman in the history of mankind, to the Queen of Egypt - legendary Cleopatra. To this day the mysterious persona of Cleopatra excites the minds of writers, film directors, artists and advertising creatives. Interpretation of her fashion looks are often seen on runways and red carpet events. Often none of these popular culture images of Cleopatra are true to the history. Thus, Cleopatra stays the intriguing historical figure, almost mythological creature, making us wonder who she really was. She became queen at the age of 17 or 18, and ruled Egypt with her father King Ptolemy XII Auletes. After his death she married her brothers as it was accustomed in pharaoh families. Later, during the 'game of thrones', Cleopatra put to death all her siblings, and became the only heir of Ptolemaic fortune. Today Cleopatra's wealth would equal around 100 billion dollars! It is impossible to imagine Cleopatra without her iconic bold make-up with striking eyeliner. The Egyptian queen was indeed a make up and beauty products expert. She liked to experiment with different products, and used mixes of different oils, iodine, iron oxide, seaweed, clay, henna and other ingredients for makeup. For example, to fill her beautiful brows and line the eyes, Cleopatra used Kohl - a cream made from the sheep's fat mixed with powdered lead. The Queen also had her own perfume factory near the Dead sea. Moreover, Cleopatra was a scientist and researcher, and its is believed she wrote a book called Cosmetics. The book was a serious work about medicine and pharmacology, and also contained great beauty secrets. Cleopatra was fluent in more than nine languages, including Greek, Arabic and Hebrew. (And I am here being proud of speaking five... Shame on me!). The Queen was also a mathematician, a scientist and was respected and highly appraised among everyone who was privileged to ever meet her. Moreover, she was charming, witty and a strong leader of Egypt. All these facts are greatly overlooked in our history as majority of the written knowledge about Cleopatra comes from enemy sources - Rome. Romans preferred to portray Cleopatra as a seductress and a mistress to powerful Roman men. There is no doubt Cleopatra was an extraordinary woman, and was found irresistible by many men who looked upon on her. However, coins with her portrait, her ancient sculptures and writings about her that survived to these days, note that the Queen had strong jaw line, long nose and thin lips. Plutarch in his Life of Anthony wrote that Cleopatra's "beauty, as we are told, was in itself neither altogether incomparable, nor such as to strike those who saw her." And that the Queen's real attractiveness was her wit, charm and "sweetness in the tones of her voice." Cleopatra presented herself as a living goddess, the reincarnation of Isis. She often used stagecraft and tricks to impress her people and potential allies. Cleopatra carefully planned every entrance, and used a great deal of magnificent decor, rich clothing and surprise elements to reinforce her divine status. One of the greatest examples was when she arrived on a golden boat adorned with purple sails and rowed by oars made of silver. The Queen was made up to look like the Greek Goddess Aphrodite, and she sat beneath a gilded canopy while attendants dressed as beautiful cupids fanned her and burned sweet -smelling incense. Antony - who considered himself the embodiment of the Greek God Dionysus - was smitten. Did you know that Cleopatra is the most played female in the history of cinema? Over 50 actresses has played the role of the legendary Queen only in the movies, and much more depicted her in the theatre plays, advertisements and music videos.